Don't miss the video for compelling evidence that Soros, as usual, is the head of this snake. -W.E. Leftist billionaire George Soros is funding the well-organized anti-Trump migrant caravan invasion from Central America that has been hitting the United States-Mexico border in defiance of immigration enforcement. Former AILA President Victor Nieblas Pradas is behind the Soros-led caravans and contends that detaining mothers and their children who break into the U.S. illegally is inhumane, unfair and unjust. "There is simply no humane way to detain families,” Pradis declared in an AILA announcement. “Asylum seeking families should be given due process, not expedited removal – and the end of the road must be the end of family detention entirely." 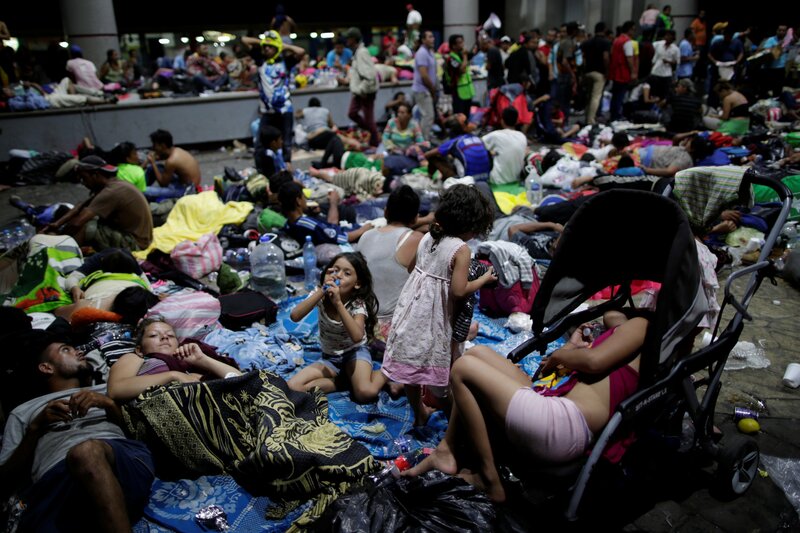 With the CARA coalition being officially announced last week, it was also reported by WND that other groups financially supporting the northbound Central American migrant caravans through Mexico include the Ford Foundation, the Carnegie Corporation and the MacArthur Foundation. It was also stressed that there are deep ties between this left-wing activism attacking the border and corporate and foundation sponsorship, as Pueblo Sin Fronteras has been recognized as a member of the National Day Laborer Network – a group affiliated with United for Justice and Peace, Caravan Against Fear and the Freedom Road Socialist Organization. The financial and political connections between Soros and the radical pro-immigration activist group was revealed last month. His interference with national borders is challenging numerous governments’ customs policies so that he can unleash his global mass-immigration movement, which is being countered across the globe. Cash-strapped Democrats are grateful for Soros’ deep pockets, as elected officials are happy to forward the billionaire’s anti-Trump, pro-immigration agenda. Oregon Republican Chairman Bill Currier pointed out the leftwing conspiracy masterminded by Soros and funded by his deep pockets. Writing checks to mobilize the invasion of Western democracies to alleviate the so-called “refugee crisis” is something Soros has been doing for years. “Soros pledged Sept. 20, 2016, to invest up to $500 million in programs and companies benefiting migrants and refugees ‘fleeing life-threatening situations,’” WND recounted. Soros’ agenda works hand-in-hand with Pueblo Sin Fronteras’ initiative, which was formed to give preferential treatment to migrants – above and beyond that given to long-established citizens of numerous nations. “We will invest in startups, established companies, social impact initiatives, and businesses started by migrants and refugees,” Pueblo Sin Fronteras declared in an official statement obtained by WND. In fact, the very name, “Pueblo Sin Fronteras” – translated “People Without Borders” from Spanish – is derived from the group’s objective of “abolishing borders” – which was highlighted by the group when the caravans to the U.S. border started in March. About 20 U.S. attorneys traveled across the U.S.-Mexico border to Tijuana over the weekend to give 400 Central American caravan migrants free one-on-one legal workshops, with some already illegally entering the U.S. to test Trump’s tough-on-immigration policies. Corroborating Trump’s promise to uphold U.S. immigration laws, U.S. Secretary of Homeland Security Kirstjen M. Nielsen assured American citizens that the administration has been tracking the San Diego-bound caravan with all due diligence. Soros has been busy over the past year using his billions of dollars to shift the world’s populations and set up his agenda across the globe. And Soros’ repopulation legacy will not die out once he passes away. Anti-law enforcement and anti-Trump groups inside America’s borders have also been funded by Soros, who has a long-established track record of attacking conservatives and biblical values. It was also noted that next to the Bill and Melinda Gates Foundation, Soros’ foundation is the largest philanthropic organization in the U.S., as former President Barack Obama was noted to also have ties with the influential billionaire. The government watchdog organization was able to access the records after utilizing the Freedom of Information Act (FOIA) via a lawsuit it waged against the State Department and the U.S Agency for International Development. Numerous “refugees” slated to enter Israel, Italy and Hungary have also reportedly been funded through migrant programs financially backed by Soros.